Students hold a banner that reads: “We will continue our education under the name of Education University.” Photo by RAWA. 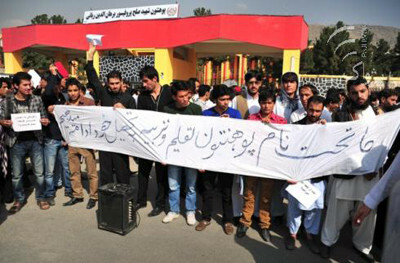 Students at the Education University in Kabul enter their sixth day of peaceful demonstrations and a boycott of classes as they protest the renaming of their school after Professor Burhanduddin Rabbani. Rabbani was the former president of Afghanistan from 1992 to 1996 — when the country was plunged into a state of anarchy that led to the destruction of Kabul, the death of 60,000 people and the eventual creation of the Taliban — and later became head of the Peace Council formed by President Hamid Karzai to pave way for peace and reconciliation in Afghanistan. Rabbani was assassinated — apparently by a Taliban suicide bomber — in his house in Kabul last year. President Karzai issued a decree to rename the university on September 20, the first anniversary of Rabbani’s death. In response, students from all ethnic groups in Afghanistan, including Tajiks, Pashtuns, Hazaras and Uzbeks, organized protests and a boycott of classes, which have thus far remained nonviolent. (Protests are common in Afghan universities but often turn violent.) The government has not repressed the protests yet but has deployed a force of almost 200 police in the area to rein in the protesters. “Though we respect Rabbani, we have other martyrs as well who should also be respected. We do not want to politicize our university,” explained one of the demonstrators, on the condition of anonymity. He believes that this act by the government will poison the peaceful atmosphere of the university where he and his fellow students study alongside each other like brothers. On Tuesday, approximately 300 demonstrators marched to the Parliament with banners stating that they did not want to study under Rabbani’s name and chanted slogans against the government’s decision. A number of parliamentarians showed solidarity with the students and joined them. Hamidzai Lali, a member of the National Assembly from Kandahar, said that President Karzai should name his own village and townships in Kandahar with the names of the people whom he likes, but not the educational institutions. There were news reports that professors at the university also took part of the demonstrations, but the claim was later rejected by university authorities. Though the government has thus far turned a deaf ear to the students’ demand, the protesters vow to continue their peaceful demonstrations and will refuse to go to class until the government annuls its decision to rename the university.